WGTS Listeners Share in a "Night of Hope"
More than 1,000 WGTS listeners came together at Potomac Conference's Sligo church in Takoma Park, Md., to hear about the hope that Jesus brings at the WGTS “Night of Hope.” In recent years as the WGTS 91.9 audience has grown, one of the ways the WGTS team reaches out to the 40 percent of listeners who don’t identify as Christians is through this event. "Night of Hope" features well-known worship music from WGTS artists and an inspirational message encouraging people to get to know Christ better. 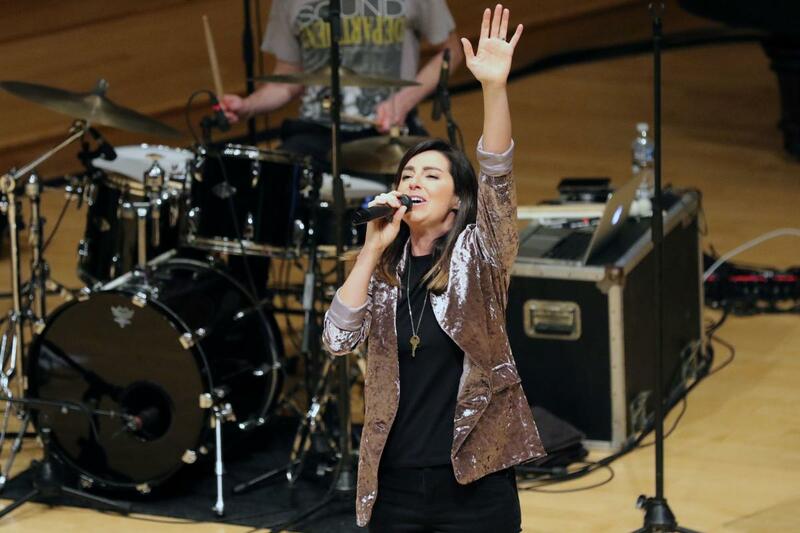 For the most recent "Night of Hope," Word Records recording artist Meredith Andrews (pictured above) led worship for the event. Terry Johnsson, former WGTS 91.9 chaplain, former Sligo Seventh-day church pastor and honor guard for three U.S. presidents, gave a powerful message. Johnsson shared how God has a plan for each and every person's life. He shared how many people called him retarded when he was young, and the superintendent of schools suggested his mom institutionalize him. Thankfully she didn't, because Terry was simply suffering from severe dyslexia and ADHD. At a small Christian school, a second-grade teacher asked to have Terry in her class. She spent a lot of time one and one with him and taught him to read, and that changed his life. 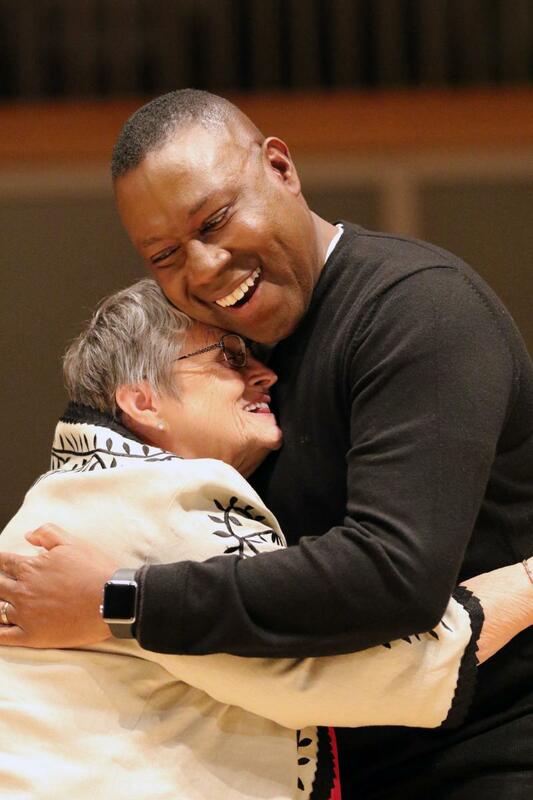 He hadn't seen her in 43 years, but WGTS reunited him with his teacher, Connie Sherlock (pictured with Johnsson) , on-stage in front of the "Night of Hope" crowd. “Seeing Mrs. Sherlock and Terry meet reminded me how powerful our words are to impact those around us and to elevate us to where God has called us to be. I hope our listeners left realizing their own potential and feeling encouraged that no matter what someone might have said to discourage them in the past, God still has a true calling for them," says Jackie Ventouris, WGTS office manager. After the service listeners had a chance to pray with volunteers and pastors from Sligo church and Chesapeake Conference's New Hope church in Fulton, Md. In addition to live prayer, 135 people dropped off response cards asking for additional prayer. “It was spectacular, worshipful, moving and beyond hopeful. I think people who came to the event were blessed, but I think the people who were hosting the event were blessed the most. It was amazing to be a part of Team Christ,” says Cheryl Wilson-Bridges, worship pastor at Sligo Church.